Purpetielli affogati, or Braised Baby Octopus is one of Naples’ favorite dishes. Octopus is a popular food all around the Mediterranean basin and yet elsewhere it is often, for some reason, ‘controversial’. Many people who will happily scarf down fried calamari will shudder at the thought of eating its close cousin, which is too bad, because octopus is one of the finest fruits of the sea. When properly cooked, it is perfectly delicious, tasting much like squid but… more so, with a deeper flavor, almost ‘gamey’, in a good way. It is also very affordable. The main issue with octopus is toughness. 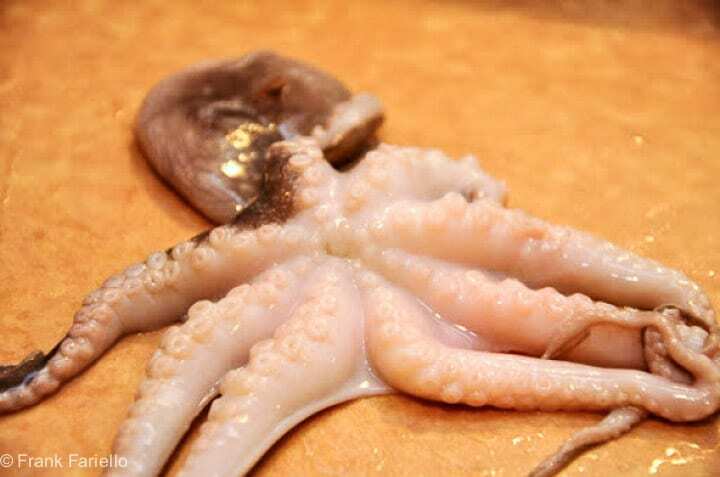 Large octopus needs to be cooked for a very long time, and they are often beaten beforehand, a bit like tripe, for tenderize them. But baby octopus is another story. It needs long slow cooking, but 45 minutes to an hour is often enough for the smallest varieties. Slightly more mature octopus is sometimes also sold as ‘baby’ octopus, so cooking times may vary. Like squid, octopus also need to be cleaned (see Notes below) but more often than not they are sold pre-cleaned. Or you can ask your friendly fishmonger to clean them for you. Once they’re clean, rinse them well and set them in a bowl until you are ready to begin cooking. Place your baby octopus, whole, into a pot (traditionally terracotta but enameled cast iron or even a heavy stainless or copper pot will do fine) together with about half as much by weight of canned tomatoes, a drizzle of olive oil, some chopped garlic, a dash of salt and, if you want a little heat, some red pepper flakes. Cover tightly and simmer over lowish heat for 45 minutes to an hour. By this time, the octopus should be tender and the sauce should be nice and thick, and rather darker than when it started. If the octopus is done but the sauce still rather thin, which can happened since octopus tend to shed liquid while cooking, you can fish them out of the sauce and continue reducing until you have the right consistency, then add the octopus back in to heat up again. If, on the other hand, the sauce has reduced but the octopus still needs some more cooking, then just add a bit of water and continue simmering. About 5-10 minutes before the dish is done, add some chopped parsley. Serve your Braised Baby Octopus hot, with a bit of the sauce and, if you like, some more parsley and/or a drizzle of olive oil on top. A bit like a pizzaiola, the red sauce from this dish makes a delicious dressing for pasta. If you want more sauce, you can up the ratio of tomato to octopus from 1:2 to 1:1. The pasta could be served as a primo before the octopus or at a separate meal. You can also use a pressure cooker to speed up the cooking time. It should take about 20-30 minutes after it comes up to pressure. You will then need to simmer it for a few minutes to reduce the sauce, since there is much less evaporation when cooking under pressure. The august Jeane Caròla Francesconi includes a recipe for Braised Baby Octopus in her masterwork, La cucina napoletana. She is very adamant that you should make sure that the lid should be tight when simmering, and suggests using a piece of waxed paper (you could also use aluminum foil) to ensure a seal. And she admonishes the reader not to open the lid during the simmering. Not sure why but I won’t question her wisdom! Of course, this is not an issue when using a pressure cooker. This fine article by Mark Bittman on octopus, in particular its cleaning, for The Splendid Table is well-worth a read. Tried this dish and prepared it on for two hours in the slow cooker. My husband who’s not a fan of seafood enjoyed along with my mom who’s Italian. The only change I made was added a juice of a whole lemon and two fresh chopped jalapeños. She was impressed with the meal a different version from the one she used to make while we were growing up. Thanks for an amazing recipie to add to my collection. Viva Purpettielli !! So glad you all liked it, Mary. Thanks for your comment! @Yue, If you do decide to try it, let us know how you like it! This dish looks so yummy! I like octopus. It's more common in Asian cuisine. and it does take a long time to cook. we slow cook it for hours in soup. I always wanna try authentic Italian food, something besides pasta. maybe will get something interesting from here! Thanks, folks! Octopus is one of those things that will win you over once you've had it done well. @sortachef: Don, I was curious about the tight lid as well. Not sure what it does but I never ignore advice from Ms. Francesconi! Thanks Frank. I've tried to make octopus a few times, so I'm curious to hear about the 'tightly lidded pan' part. That may be one reason for my limited success. Great info as always! That's a beautiful dish! I can taste it just by looking at it. Nice work. And I'm with you. There would be more happy people in the world if they'd just open themselves to the polpo. I've never made it – it's hard to find but not impossible. Have been thinking about it so maybe you spurred me on – I only had it Christmas Eve growing up when Grandma and my Aunt prepared the Feast of the Seven Fishes. Memories from octopus. I don't know if I'm ready to tackle a whole octopus, but I have eaten, and liked, octopus sushi. I think if someone prepared Polpetielli for me I would enjoy it.